This white fish has a sweet, delicate flavour and is therefore best treated simply in the cooking process. Grilling or roasting gives its silver skin a deliciously crunchy crackle. Roasted fillet of sea bass served with steamed pak choi, provencale vegetable vinaigrette and a fresh black olive tapenade. Oven roasted fillet of sea bass served with asparagus and a basil butter sauce. A fillet of sea bass cooked with black olive tapenade and served with an aubergine, courgette and red pepper ratatouille. Crisp fillet of sea bass served with gently cooked tomatoes, shallots and basil. A crisp fillet of sea bass served with a brown shrimp sauce and blanched samphire. 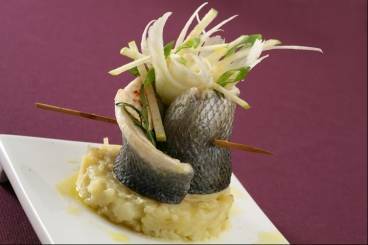 A rolled sea bass fillet, steamed with tarragon, a potato smash with horseradish, crispy green apple and sliced raw fennel salad. A classic sushi with sea bass, cucumber pickle in rice wine vinegar and wasabi. Crisp fillet of sea bass served with cumin glazed carrots, honey and orange sauce and dark chocolate shavings. 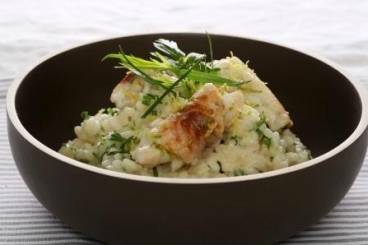 Chive, parsley and tarragon risotto served with thin slices of pan fried sea bass cooked in peanut oil with lemon and lime. 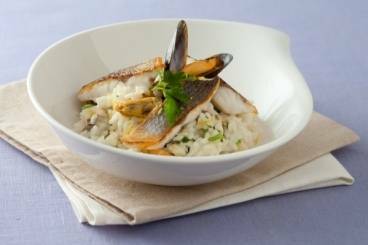 Clam and mussel risotto topped with crisp pieces of sea bass and fresh parsley.